Tashi is an independent feature film made on an almost zero budget by a small group of people in Singapore who are passionate about cinema. Tashi has been quietly making its presence felt—first winning an award at the Calcutta International Cult Film Festival 2018, and now, an official selection at the Dhaka International Film Festival 2019, as well as a nomination at the New Delhi Film Festival 2018. Tashi is directed by Shilpa Krishnan Shukla, an award-winning filmmaker who focuses on independent, zero budget films that she writes, directs and produces, while pursuing her full time career as a marketing director with a global healthcare company. 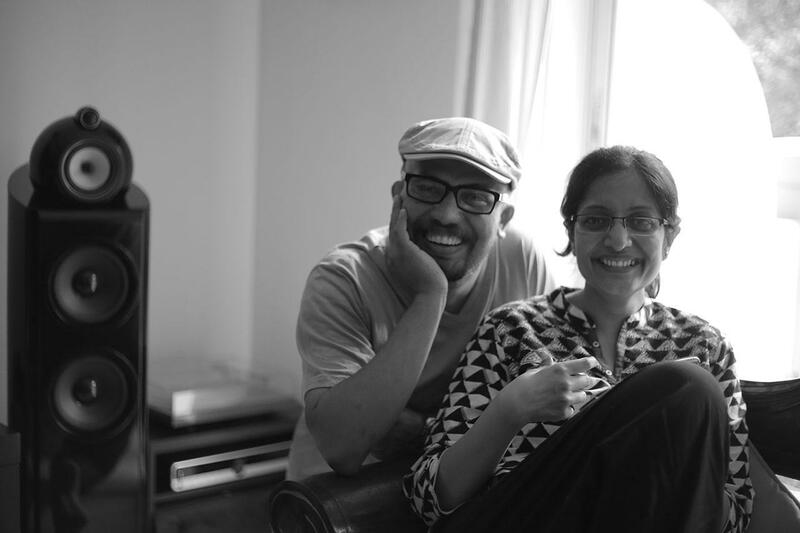 Tashi is Shilpa’s third directorial feature film. On a cosy Saturday afternoon, Ram caught up with the cast and the director of Tashi at a restaurant, just before its private screening. Read on to know more about their acting journeys, inspirations, processes and memories. Ram: Tell us about your acting journey so far. What work have you done before Tashi? Tania: I took acting seriously after my son was born in 2006. My first theatre project was in 2010. Since then I’ve never looked back. I got into films, did more stage plays. I feel that it was always my calling to be an actor. In India we don’t look at acting as a serious profession. I completed my Master’s in Pharmaceutical Sciences, and I was working with Ranbaxy in India before moving to Singapore. In Singapore, I was working with Glaxo, and then my baby was born. I stumbled into acting. There was never a plan. If I don’t work in a pharmaceutical organisation, what do I do? I wanted to spend more time with my child. That’s how acting happened. Tania made her film acting debut in 2012 with the feature film A Gran Plan. 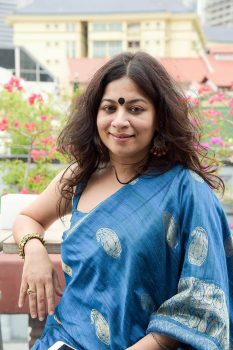 Her short film Ex Wala Love was screened in the Mumbai Women’s International Film Festival 2014, and in March 2015, as part of the 6th Singapore Short Film Awards. Anvita: I got into acting at the age of five. It is a hobby, a way to explore my dramatic nature. I was born a drama queen, my family will vouch for this! I think everybody else here would agree as well. I never took acting seriously until I turned 28. I was working in advertising and marketing. That’s what I studied as well. I do a bit of writing as well. I got serious about acting because I felt that the world of television and film is now evolving. There are more opportunities. So I thought thoda chance le sakte hein [I can take a chance]. We can definitely give it a shot and see where this can go. The commercial aspect is now devolving, there are more human stories, real stories are being told, more work is being created. Shilpa’s film (Tashi) is my second feature film. Anvita believes that to develop better instincts as an actor, one must understand and dabble in all facets of filmmaking. She actively participates in several projects as an assistant director, production manager, sound assistant and hair, makeup and costume coordinator. Her hobbies extend to singing at open mic events, painting as a stress-buster, traveling and downing a few beers over conversations of intellect and random musings, with friends and strangers alike. Anvita is now making her way to Mumbai, India’s film capital, to manifest her aspirations into reality. Ila Aunty: I think I’m not supposed to speak anything. I have never acted in my life. My husband, Dinesh, was very fond of acting…he acted in Masters of the Sea, Mediacorp’s first English drama series (he played the role of Dr. Gupta). He also acted in its second season In Troubled Waters. So his influence was there. But I’m a housewife, I have never acted in my life. I don’t know why Shilpa is asking me to do all this. I’ve said this before that it’s not a challenge to me but more of a challenge to her! In a career spanning over 30 years, Ila Maheshwari has worked across various sectors including consumer retail, real estate, hospitality, general international trading, automotive as well as education. She retired as the General Manager of one of Singapore’s most successful serviced office businesses in 2001. 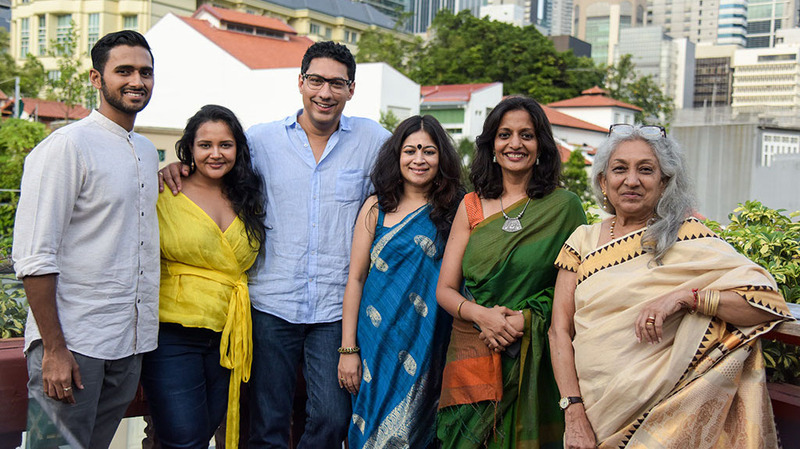 Celebrated journalist, Deepika Shetty, recognised and popularised what is now known as the Ila Maheshwari Saree Drape, and this led to Ila’s first short film opportunity, Fall Bidding, with Sarika Joshi. Tashi is Ila’s first feature film. Shilpa: Aunty did a short film before Tashi. Ila Aunty: Yes, that also happened because of the director, not because of me. She wanted me to act and I did it. I have never acted in my life. I like music and dancing, rather than acting. I’m from India. I have done Master’s in Psychology. What else? I’m just an old lady, a housewife! Shilpa: Aunty would drive her car and arrive each day at the venue for rehearsals and shoots. She’s 71. She’s so spirited. She keeps saying she’s an old lady but not really! Tania: She would stay up with us until 2 AM for all our shoots. They would want her to stay till late in the night, and she would be there. She never left the shoot early. Sai: Acting wasn’t something I thought would play a part in my life, until even five or six years ago. I had acted in a play when I was ten years old. Nothing much otherwise. Four years ago, when I was in college, I wanted to try something different. Part of this different experience was acting in a play. Once I acted, I realised that I really enjoy the process of it. I enjoy the performance aspect. I wanted to experience it a bit more. My sister knew Shilpa. When Shilpa had an audition call for this film, I thought it might be an opportunity I could explore. I’m still very new to this field. Sai Pogaru is an upcoming actor with a passion for impacting people through media and enterprise. He has previously acted in an independent short film titled Hello Old Friend. He is currently working in Sales and Advertising. In his spare time, Sai enjoys playing cricket, watching films, and traveling the world. Ram: (to Charan) Each of them is sharing their acting journey. Tell us about yours! Tania: Should we leave? (laughing) Will you take too long to answer? Charan: (pointing at Ram’s phone recording the interview) How much memory does your iPhone have? Is it 128GB or 256GB? (laughs) I was acting in school and college. I gave up acting for a very long period, almost 25 years. My main profession is shipping. I rediscovered acting in London in 2010. Since then, I’ve been doing about two plays a year. I did one play and a couple of films in 2017. Shilpa came to watch one of our plays and that’s where she met some of the cast. She wrote Tashi for us. In 2010 Charan joined Aks Performing Arts, London’s Premier South Asian Theatre Company. 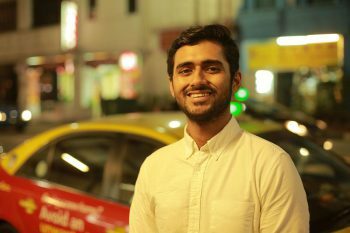 He made his first appearance on a Singapore stage in September 2016 when he played the lead male character in Gauri Gupta’s The Dance of the Birds. Ram: Is there an acting performance in any film that you are always amazed by, that you find very inspiring? It could be from a film in any language. Tell me about that one performance you’d love to match or that you think you can never match in your life. Tania: I have many roles that I would love to play but I think Shabana Azmi in Masoom and Tabu in Maqbool are two roles that I find inspiring. Shabana Azmi is one actress that I really look up to. There’s also Aparna Sen. But I think what Shabana did in Masoom, the way she played the mother and the wife—that was fantastic. Her emotions and the way she balanced out the whole character, so realistic. It’s very difficult to do. If I can ever do something like that in my life, I will be very happy. In February 2018 in Padatik Theatre’s production Atmakatha, Tania played one of the protagonists alongside actor Kulbhushan Kharbanda. Anvita: As an actor, it’s really not about which role I can play differently or better. What attracts me to a role is something that’s different about it, something that’s not me, something that I can allow myself to portray, as a character. The one kind of character that I really hope cinema allows is women playing very uninhibited and unabashed villains. It shouldn’t be because of a man coming into the picture. They should be down-to-the-core evil like Nawazuddin Siddiqui in Raman Raghav 2.0. I would really like a woman to be playing that. At some point in my career I hope that I get a chance to do that. Absolutely nothing to do with the beauty of a woman but everything to do with her character. 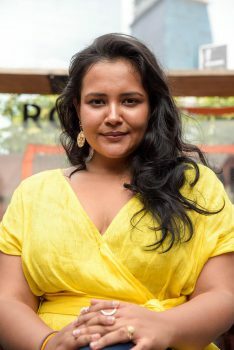 Anvita has played the lead protagonist Amrit for Cannes lauded Singaporean director K.Rajagopal’s Lizard On The Wall inspired by Balli Kaur Jaswal’s novel Inheritance. 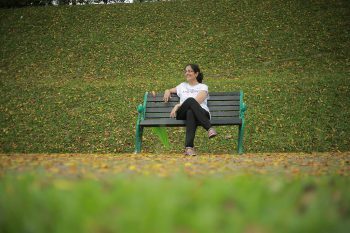 She won the Best Actor award at the 48 Hour Film Project Singapore 2015 for the short film Guilt. 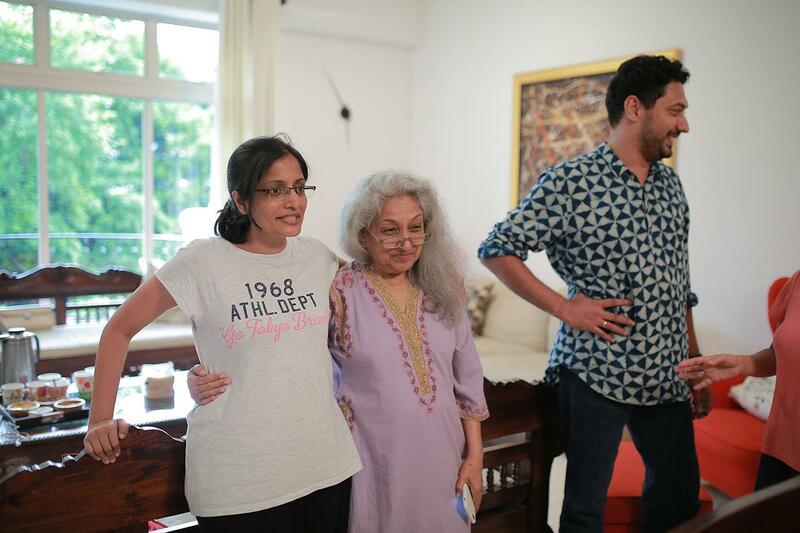 Ila Aunty: Everyone knows my all time favourite acting performance! It’s Amitabh Bachchan! I love him. I always feel as if I’m Jaya Bhaduri (Amitabh Bachchan’s wife’s maiden name). My way of dressing and sense of style used to match Jaya Bachchan. I love two of Amitabh’s films the most – Abhimaan and Silsila. If one day Shilpa can put me in front of Amitabh Bachchan I want to tell him that I would love to do that type of role, whether I can act or not. I’m not sure I can act but I would love to do that. Ram: Is there any specific reason you like those two films? 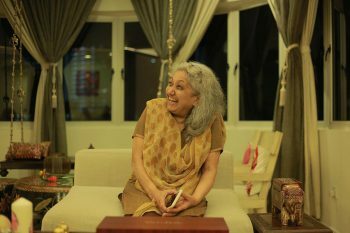 Ila Aunty: I think the subject of those two films was very sensitive, especially Abhimaan. I always feel that ego is the biggest problem in our life. That film focused on a husband’s ego when his wife was doing better than him. Silsila was very different but in the end the wife wins. So these two films are my all time favourites. Sai: I like James McAvoy in this movie called Split. He played twenty different characters in one film. I was fascinated by that. Another acting performance that I really admire is Christian Bale in The Machinist. He lost 20 or 30 kg for the film. That’s phenomenal. When someone is so dedicated to their profession that they’re willing to undergo so much physical torture just to play a character. I respect that. Charan: There are many roles that I can never do! (laughs) In terms of best actors, best performances I can’t pick one. There are just way too many! I agree with the names Sai mentioned. I’m a huge fan of Amitabh Bachchan just like Aunty. I’m also a huge fan of Aamir Khan, Naseeruddin Shah. What Christian Bale did for The Machinist is what Aamir Khan does for a role. He transforms his body and body language. Like Anvita said the challenge for an actor is to play roles that are different from you. To play roles that are similar to you is equally enjoyable but not that much of a challenge. Playing something completely different from your body language would be a challenge. Ram: Shilpa! My next question is to you! Shilpa: You want to know my favourite acting performance? Ram: No! You must have done a lot of rehearsals for Tashi, like you did for your previous films. I’m curious to know what exactly are you looking for during rehearsals. When do you say, “Okay we’re ready!”? Charan: All of us have answers to that question! Tania: We’ve never heard “We are ready!” from Shilpa! Tania: You have to tell them about the 80:20 rule. Tania: Shilpa has this amazing concept which she will explain. Charan: Let her speak! It’s about time! Shilpa: About time! Can you write about this? How a director gets ragged for no reason! (laughs) Initial rehearsals will all be rubbish. Everybody will act, like act (rolls her eyes). This one— (points to Charan) you can see how over the top he is even in real life. So making him look like a normal human being on screen is quite difficult. (Charan laughs) These people had come from acting in theatre. So their acting was a bit theatrical. When actors read the script, they have certain ideas in their mind about how to portray it, which usually tends to be a few shades higher than what is actually needed. Two things I look for: one is how real and natural it feels, second thing is do I feel the scene, the emotion that was supposed to come. That doesn’t necessarily have to be how they deliver the lines. It could also be the amount of pause in the scene, amount of silence in the scene. Once I feel the scene, I go for the shoot. Shilpa has done a fair amount of theatre in school and college. She wrote, directed and choreographed Bollywood Beats, the first Indian original musical in National University of Singapore. 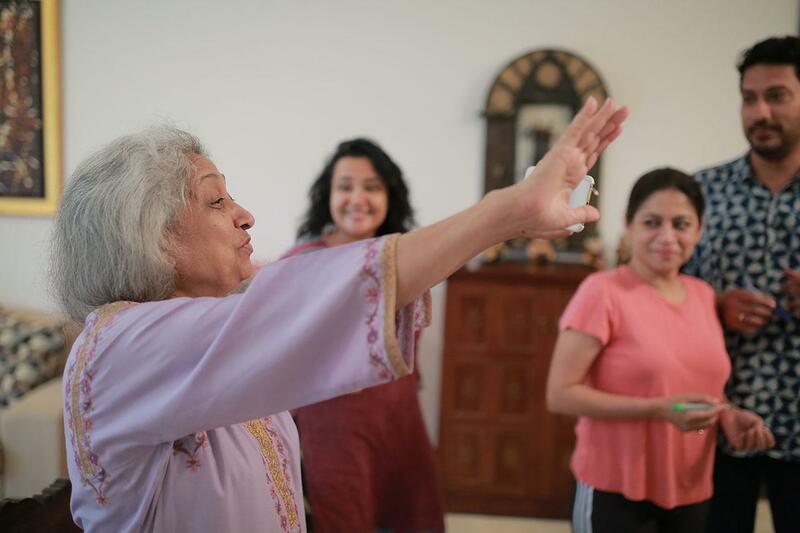 Later, she directed and produced Kathaah – Stories from India, featuring three short stories by eminent Indian authors which she adapted for the stage. The stories featured were Kabuliwala by Rabindranath Tagore, Second Opinion by R. K. Narayan and Walls by Vaikom Muhammad Basheer. Ram: Since you mentioned theatre, and you’ve directed plays too, what do you think is the difference between acting for stage and acting on film? Shilpa: In theatre, they have a little more room to be louder. The theatre work that I have done in the past, except for one, they are not commonplace themes. It can be a bit caricaturish like my short film Aravindum Aarumughamum. It can be over the top. Tashi had to feel real, like it can happen in your home. That’s very different. Even when there are scenes where you can go higher like her breakdown scene for example (pointing to Tania), I ask her to tone it down versus bringing it up. Toning down is what actors find harder to do. Ram: Since all the scenes were rehearsed beforehand, were there any moments during the shoot that you hadn’t planned for, that came out much better than in the rehearsals? Shilpa: What people would think are the critical scenes in the film, like the climax and the emotional breakdowns, are the ones that I have least rehearsed. There’s one place where she breaks down (pointing to Anvita). We didn’t rehearse it at all. We rehearsed her breakdown once (pointing to Tania) and that was more for her to learn the lines. I feel actors are somehow better at the emotional scenes. Maybe it’s because they work on those things. I don’t know! Tania: I think you let us be spontaneous. Shilpa: Yes, you should let it be. You can’t direct or control emotional outbreaks. The only conversation between the two of them (Sai and Anvita) in the film is about a letter. We never rehearsed that. I feel those are emotions that have to come in the moment. There have been quite a few like that. The ones I rehearse are scenes with long dialogues. The emotional graph needs to be correct. For very short stuff which is in the moment—the actors just deliver and I’m comfortable to leave it that way, without rehearsals. Ram: Shilpa’s films always present a perspective on life and relationships. Is there something you’ve learnt by playing your character in Tashi? Charan: Are we going clockwise or anti-clockwise? Charan: I’m saying let’s go the opposite way so I get to answer last! I don’t mind going first. I play a character named Sanjay. He’s your simple next-door man, he has a family, he goes through some bad times personally and professionally, he copes with them like many people would, though not necessarily in the best way. He goes down a route that many people do—not all. His family’s love and support helps bring him out of his downward spiral. I learnt as an actor and a person. I’m still learning as an actor. Shilpa worked very hard on me to be less theatrical and more natural. That’s a work in progress. I don’t think I’ve reached where she would like me to be. It’s about being honest with your loved ones and keeping them in the loop about what’s going on in your life. You don’t have to go through the hard part of your life all by yourself. There are loved ones around you all the time, who are there to share that period with you. I as a person didn’t always share. I share my highs but not my lows. Besides learning something about life from my character Sanjay, I learnt from the other four characters as well. They’re all going through something. If I look around me, now I look at people more carefully—what they’re going through in real life and how they cope with it. I don’t have to see a movie or read a story for this. You see people around you, your aunts, your uncles, your cousins, nephews, nieces, brothers and sisters—they’re all going through something. How do they cope with it? Tania: My character Radhika is very simple, sorted, dedicated. She knows what she’s doing in life. Her priorities are very clear. She’s forty years old, not married. She is looking after her aging mother. That is all she’s focusing on. She has a job and is supporting the family. The thing that I have taken away from this film is one line she says. I think I’m still working on that in my real life. At one instance, Radhika is apologising to her mother for something she has done. She says, “Ma, I’m perfectly happy with my life. I’m really thankful for whatever I have and I realise that.” I think that is what I have taken from Tashi. It’s a very positive film. Once people watch it, they’ll feel a little closer to their parents. They will want to make that phone call, realise what their parents must be going through. There’s a very warm feeling about the whole film. Shilpa: Aunty, think of Amitabh Bachchan. Words will automatically come! 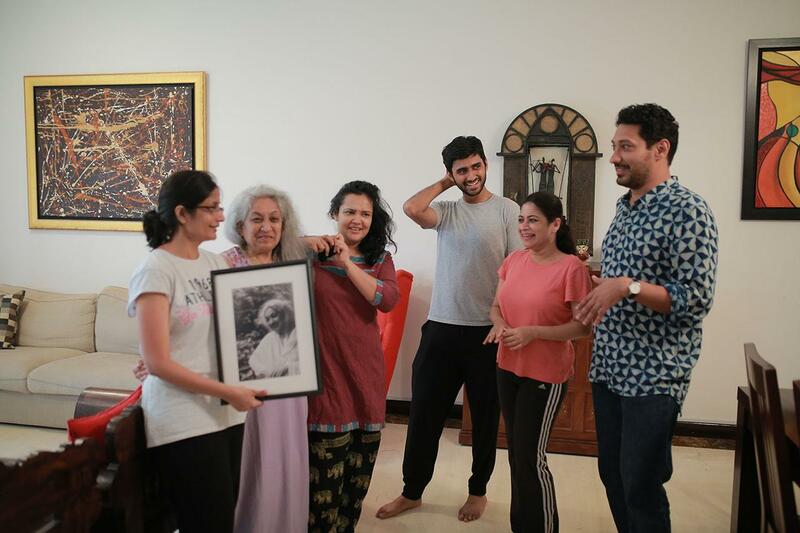 Ila Aunty with a framed photo signed by the film’s cast and crew after Tashi‘s shoot. Ila Aunty: (smiles) …who is a dedicated mother, wife and artist. 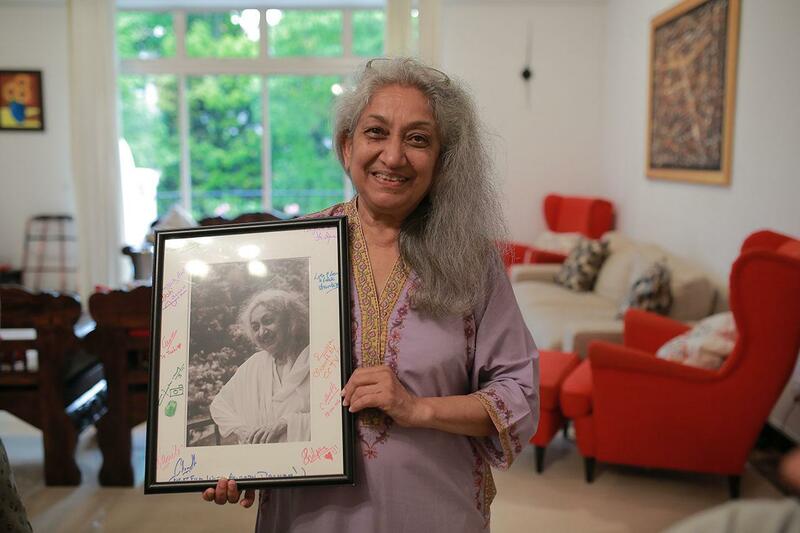 She is critically ill and yet she’s living her life in a very positive manner. This entire film… I was able to connect it to my life. I will just quote one thing my character says: “Even Buddha died. Death is going to happen and it’s not too bad. That gives me a lot of courage.” At this age, I really think it’s giving me a lot of courage. The second thing I like is a line that Priya (played by Anvita) says. “Who listens to my chatter?” I won’t like to explain but yes in my married life, in the early days, I felt the same way. I didn’t tell anything to anyone. Whenever I faced something odd in my life, I wrote a letter to my mother. I put it in an envelope but I never posted it. In the film, she (Anvita) writes letters to her mother. I was writing too, but I was not posting those letters. It made me calm and helped me live peacefully. Anvita: That’s beautiful. We didn’t know that. (everyone nods) My character Priya is a very down-to-earth, sweet, simple character. She has absolutely no negativity attached to her because she takes everything in her stride. She thinks, “This is my life, I have my world around me and I’m content with whatever I’m given.” And that’s Priya for you. This was a little different for me because while I’m a positive person, I’m not, as any normal human being, content or satisfied. So that was a lesson I got from her. The simplicity of things, to take it in your stride, you have just one life! There are certain nuances about acting that you don’t know but learn through your character. There were certain ways in which I presented my body language which Shilpa was gracious enough to point out. It’s going to help me down the line. It not only helped me understand the character, but also helped me understand myself as an actor. Sai: While playing Ved, I was reminded of the fact that people are complex. People have their happy moments but they also go through lows. Ved’s character reminded me that it’s during those tough times your character is truly tested. Two things really stand out. One is forgiveness, you being able to forgive those who have done you wrong. The second thing is you being able to ask for forgiveness to those you’ve wronged. It’s a very timely reminder. Ved’s character tries to embody that, at least he comes to that realisation towards the end. Playing Ved has taught me how sometimes acting isn’t really acting, it’s a lot more personal than that. It’s about really feeling what the character is feeling. Acting is more than just a craft. It’s also about your personal investment in the character. Ram: I want to know from you all what you find to be the difference between acting in plays and acting for films. Do you prefer one of these two mediums? Charan: There’s a big difference between theatre and films. Naseeruddin Shah, an actor I admire, has said that there isn’t any difference. As long as you can be a character, it doesn’t matter whether you are on stage or on film. I haven’t reached that level yet. For me there is a difference. As Shilpa points out, I’m a little bit OTT (over the top) in theatre…because I believe that if it’s a big hall and the guy in the left corner fiftieth row needs to understand what you’re going through—if it’s just in your eyes he may not be able to see it, if it’s in your body then he may be able to see it. So there’s a little bit more use of body in theatre and less so in film. Which one do I enjoy more? I’m not sure if Shilpa will cast me anymore so I probably better say it. Charan, Tania and Sai have been cast in Shilpa’s next film project – a regional language anthology in Punjabi, Bengali and Telugu respectively. Charan: I mean after that! After I say this… Alright! I think it’ll be theatre. What I get out of theatre is instant gratification. You get feedback from the audience even as you’re performing. We performed a play which she (Shilpa) came to watch and during the sad bits you could hear people in the audience crying. You could hear people laughing. So you’re getting constant feedback and you know whether you’re communicating with them or not. In film, with the camera, you don’t get that instant feedback. You trust the director, which is fine. There’s a lot of craft in filmmaking that actually happens post-production. I don’t think we as actors can take a lot of credit. In a play, there’s a lot more that an actor gets to do. In film it’s more the maker’s skill than the actor’s. 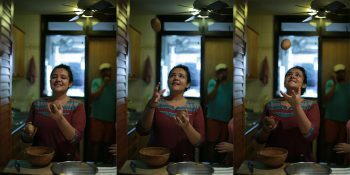 Tania: Be it theatre or film, as an actor, one has to feel. Whether you’re acting on stage or in front of the camera, it doesn’t make a difference. To be true to the part, you have to feel the role, feel the emotion. The extent to which you’ll show the emotion is a little bit more when you’re on stage. As he said, the person in the last row shouldn’t have to strain his ears to listen to what you’re saying. But that’s not a problem on camera. You just need to tone it down. I think with experience you can easily switch between these modes. That’s when rehearsals are useful. Thanks to the rehearsal process, she (Shilpa) toned down all our emotions. She knew exactly how much to rehearse, what to rehearse, which line to rehearse more, and the tone! The emotion remains the same in films and plays, how you produce the emotion will be a little different. Tania’s first much lauded theatre performance was in 2010, for the Singapore Repertory Theatre with William C. Kovacsik’s original work, The Masrayana. Tania has acted in several major productions in Singapore—Dance of the Birds remains one of her best, as it showcases her talents as an actor as well as a dancer. She has played the lead in Maya – The Demon Architect which was a part of the Kalaa Utsavam festival in Singapore. Anvita: My thoughts are pretty much the same as what the others said. In theatre you’re depending on the energy of the audience, it isn’t just you. Everyday if you put up multiple shows then your performance evolves. But when it comes to film, it’s the writer’s baby first, then the director’s baby. It’s their vision that’s manifesting itself to life. My personal opinion is a little unpopular one. I’m more a fan of film than theatre. That is because I’ve understood myself as an actor. I feel I fit better in film, the way I approach my craft. I developed it for the purposes of film. Given a chance, yes I can do theatre. It’s not that I’ve shied away from it. I do feel a lot more at home and at ease in front of the camera, or even behind it. Sai has acted in a theatre production of Shakespeare’s Hamlet. Sai: I have nothing much to add. All of them have way more experience than I do. I concur with what Anvita said. Different people adapt differently to different forms of acting. I’m someone who prefers being in front of the camera because I feel making a film is a very intricate art. It’s not just acting but there are a lot of things that go on in post-production, and the whole process fascinates me. I would like my acting to be something that complements this process. Ram: Shilpa, when you write a script, do you have faces in mind for your characters? Do you see a person performing in your mind or do you see a graph of emotions? How do you visualise acting when you’re writing? 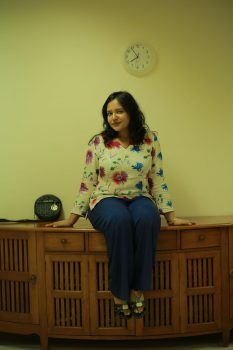 Shilpa: Usually I have folks in mind as I write. In this film, I knew I was writing for these actors. Except Sai, who came in later. I already know beforehand the actors who are going to be cast. I write only when I’m very clear about what I’m going to write. I play the scenes in my mind many times before I start writing. I don’t really know if I see these specific people in the scenes that play in my mind. I don’t know…do I? More than seeing the scene, I think I hear the lines. In fact, somebody commented the other day, it was a festival director, she had seen Pularum Iniyum Naalekal and Tashi. She said to me, “Oh your films are very dialogue-oriented. It’s less about visual craft and it’s more about dialogues and lines.” And it is! I’m happy with that. I don’t find that as an issue because that’s what I enjoy doing. I like conversations. I like how lines build up on something and take the story somewhere. If you read my scripts, there will be very little screenplay writing like “this happens and then this happens.” It will all be dialogue. Then the rest of it will come during shot breakdown, storyboarding or direction. I don’t write down screen descriptions. I think I hear that. I think of how the line feels. Which is why we rehearse only scenes which are line-heavy because then I get the graph. 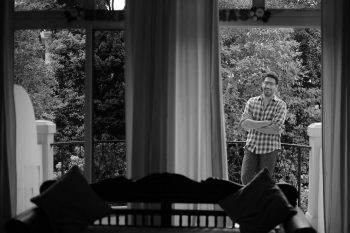 Pularum Iniyum Naalekal, a Malayalam-English bilingual feature film directed by Shilpa, went to 33 film festivals around the world and picked up 17 awards including those for Best Film, Best Director, Best Story, Best Screenplay, Best Cinematography, Best Original Score, Best Editing and Best Actress. Ram: What do you find fun when you’re acting, which part of the process do you love—is it the rehearsals or the final moment when you get to see the film? What makes acting addictive to you? Anvita: No, that is a consequence. Charan: No, in my case that’s the motivation. 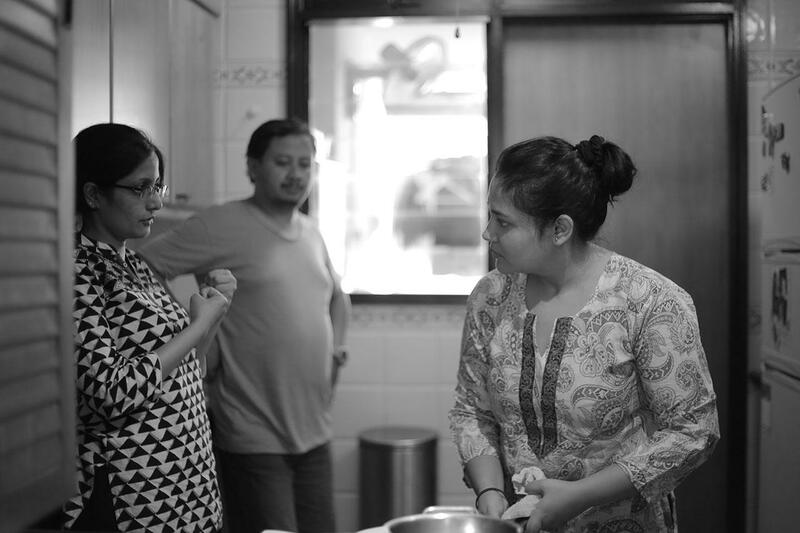 Ila Aunty: In short, Tashi is a very, very strong, emotional storyline. Ram: Aunty, any memories from the Tashi shoot that you cherish? Ila Aunty: I enjoyed every moment because I haven’t acted before. I was getting response from the director, each time she accepted and appreciated what I did…that’s all! The whole movie, whatever I have done, I have enjoyed thoroughly. Ram: How were Tashi’s rehearsals different from any of the rehearsals you’ve had before? Tania: Shilpa is very organised so she knows which scene to rehearse and how much. She will time us and shoot us. So we would try to be as perfect…not perfect sorry that’s a wrong word…as good as we can be. Because we know we have to go back home and look at the footage and cringe, “Oh my God! Why did I do this? Why did I smile like that?” I think it helps us because you get to know how OTT (over the top) you are or how much you need to tone down. Shilpa’s pointers to emote through my eyes really helped me. As an actor, for stage performances as well, I use my eyes a lot. But I didn’t know you could do that for film also. I thought it was probably too much, but she would say, “Use your eyes. Use your face. Tone down the drama.” All those were different. During other film rehearsals, I was not given these pointers. 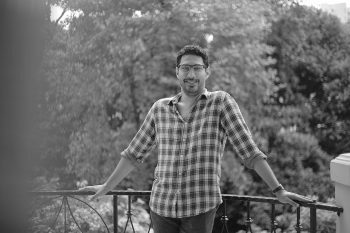 Sai: To add on to what others have said, what I find very gratifying is when the final product is out, when I get to listen or hear or read about or even see how other people perceive that film. One thing I’ve learnt about acting, I’m sure everyone else would agree with this, is that the reason people act is because you really connect with a lot of people. Just for an hour or two hours, you take people away from their own lives and you transplant them into the world of the story. I love to see people’s reactions after they watch the movie, finding out how it has affected them. Everything impacts someone in some way or the other and that to me is very gratifying. Charan: I don’t think I’m addicted to acting. I’d love to be but I’m not. I don’t have enough acting jobs. Like Anvita said it’s the sum of all parts. When you feel this is what you were meant to do, that’s a calling. Hats off to Anvita and others who have the courage to pursue it. It’s not an easy profession to pursue, it’s a challenging, challenging path to go down on. I didn’t have that courage in my younger days. What I like about it most is that it is a storytelling exercise. Everybody—writer, director, the whole team is trying to tell a story. In that story, I have a small story, as my character. The sum of all stories makes one story. I like storytelling and acting is a storytelling exercise. Remya is a cake artist and freelance photographer. Mostly self-taught, she has been active in the field of photography for more than four years. 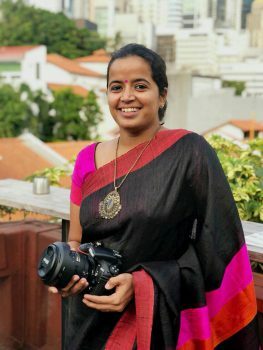 One of her notable works is the The Last Leaf, a photo series using toy animals, which was exhibited in Kerala Sahitya Kala Academy, Thrissur, Kerala. 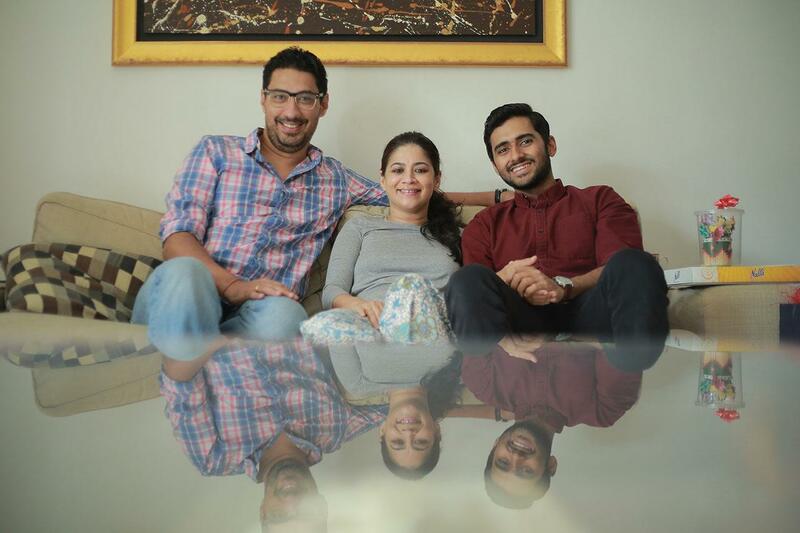 She also worked on the publicity stills for the Malayalam sitcom Athazham. Tashi is her first feature film as assistant director.